Do you feel self-conscious about the way your teeth look? Do you cover your mouth when you laugh or smile? If you have teeth that are gapped, crooked, sharp, or not as healthy as you would like, it is understandable that you might not feel confident when you smile. Some people naturally develop perfect teeth. Then there are the rest of us. The great news is, you have more options than ever before to realize a gorgeous smile and healthy-looking teeth. 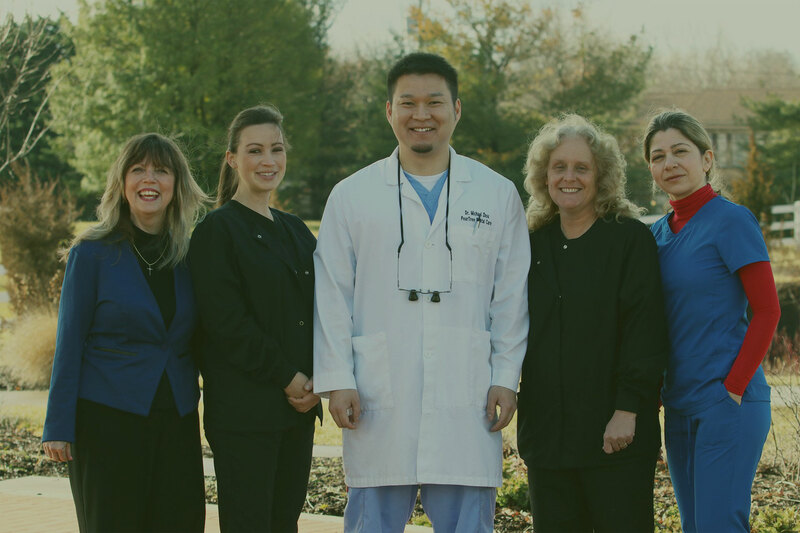 At Peartree Dental Care in Ellicott City, MD, Dr. Michael Zhou offers a variety of cosmetic dentistry procedures that can improve the look of your teeth and benefit the overall health of your mouth. Forget clunky, metal braces and a two-year-long treatment time. If Dr. Zhou deems the treatment appropriate, we can use Invisalign® clear orthodontic aligners to reshape your bite and straighten your teeth. The trays are made of clear acrylic, and they’re removable, unlike traditional fixed braces. They feature no uncomfortable metal and require no adjustment visits. Depending on Dr. Zhou’s plan for your teeth, treatment time will probably take less than two years, and in some cases less than one year is required. Skip the stains. Get a gleaming smile in one day with our professional teeth whitening procedure. Dr. Zhou and our team can apply a specialized whitening solution to your teeth to lighten or remove stains caused by coffee, foods, wine, tobacco, and other agents that stain your smile. Want all the benefits of whitening but with flexibility of using a kit at home? Dr. Zhou offers a home teeth-whitening system that will produce the same awesome results as those you would receive from in-office whitening. You will receive a custom-fitted set of trays and whitening gel. Within two weeks of daily use at home, you will enjoy whiter teeth and the confidence that comes with a gorgeous smile. Porcelain veneers can create the perfect smile: healthy, balanced, and beautiful. Each veneer is a handcrafted shell that Dr. Zhou permanently affixes to a single tooth. A set of 8 or 10 veneers will transform your smile. Porcelain veneers work for patients whose teeth are chipped, widely spaced, oddly shaped, permanently stained, or crowded. The restorations last up to 20 years or longer, and so are a worthwhile investment. However, if you are not yet prepared to take that step, consider cosmetic bonding instead. This option lasts for five to seven years and is certainly affordable. Dr. Zhou can provide the details to help you determine which option is best for you. If your teeth have sharp edges that stand out in your smile, consider tooth reshaping. With a small file, Dr. Zhou can remove a small portion of dental enamel to create a smooth, rounded shape. If your gums inhibit the look of your smile, did you know that laser treatment to reshape your gums is available? Dr. Zhou’s laser treatment gently reshapes gums to remove excess tissue or straighten an uneven gum line. As the laser works, it also seals the skin, so you won’t require stitches. Compared to traditional gum surgery, laser treatment is fast, precise, and patients recover quickly. There is no down time after the procedure, for most people. The smile of your dreams is possible with cosmetic dentistry. Peartree Dental Care is proud to be a premier provider of cosmetic dentistry for patients in the Ellicott City, MD, area. Schedule your smile consultation today or call us at (410) 750-2599 to discuss the cosmetic dental procedure that will deliver a more beautiful you. I don’t even know the way I finished up right here, however I believed this publish used to be great. I don’t recognise who you might be however certainly you are going to a famous blogger should you aren’t already. Cheers!